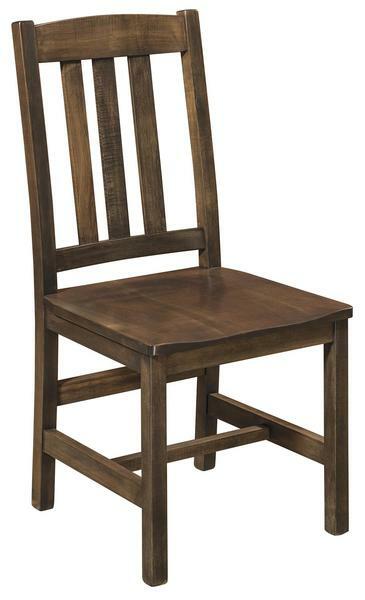 DutchCrafters Amish Mission Lodge Dining Chairs are made to be versatile and compatible for you! Keep it simple with the standard wood seat, or accent this chair's Mission style construction with fabric or leather upholstery. Perfect for the family cabin, farmhouse style kitchen or dining room, these mission dining chairs offer all the comfort and beauty you are looking for in a quality dining room chair. The appeal of mission style furniture lies in its simple style mixed with a durability you can count on. This combination keeps popular mission furniture in demand. View more mission style furniture for other areas of your home. Pull up your seat next to a loved one and share dessert and coffee in these beautiful chairs. There's nothing more enjoyable than time with friends and family; sit together in comfort and style in the Mission Lodge Dining Chairs. Consider matching stationary and swivel bar stools, deacon bench, and desk chair -- deck the whole house with Lodge style! Please call us today with any questions about our mission dining chairs. The call is toll-free at 866-272-6773.